Margaret K. McElderry Books, 9781481469159, 192pp. * "Kelly Murphy's illustrations help bring life to William Alexander's (Goblin Secrets) succinct gem: a meticulously crafted world so tangible it feels like an alternate version of our own." * "Alexander does an excellent job of building a contemporary world in which the paranormal is nevertheless ubiquitous and expected. This haunted world begs for further exploration. Though it's a perfectly enjoyable tale on a purely superficial level, readers who choose to dig deeper will find an engrossing exploration of complicated grief and what damage may be wrought when negative emotions are barricaded away rather than addressed. A fun and fast-paced supernatural mystery with secret depths for those who dare explore them." "National Book Award winner Alexander (Goblin Secrets, 2012) displays strong writing chops. 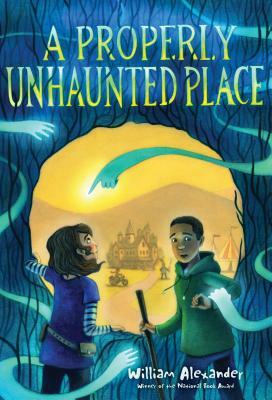 His latest is perfect for kids who like their creepy moments mixed with wildly imaginative elements (like a motorcycle-riding spirit who denies he’s dead). This should see plenty of circulation." Rosa is feisty as well as totally competent, and her no- nonsense ways match the plot’s breakneck speed...The story behind the haunting is intriguing, and it’s skillfully revealed in bits and pieces, but it never overshadows Rosa’s much more interesting spirit hunting. Kids who prefer Ghostbusters to Goosebumps will find this right up their alley. "National Book Award winner Alexander (Goblin Secrets) neatly inverts the typical ghost story, creating a supernatural landscape in which hauntings are part of the fabric of life and go hand in hand with respecting and honoring the departed. The friends’ realization that they must rely on themselves, not their parents, is relatable and poignant: Rosa’s efforts to accept her mother’s shortcomings and Jasper’s struggle to find his inner hero add depth to this charming mystery."